Today our collective global knowledge expands in many directions with the speed of bits, but at the same time we are no longer the only ones building knowledge. Computers are so powerful and intelligent now that they can build new theories and connect knowledge, statistics, topography and flows in ways that are very different from how humans do it – and more than that they have become really busy collecting and storing their own data. About the same amount of data we humans has created from we first started to document and write things down thousand of years ago and up to around year 2000, is now doubled around every other day. And soon it will be every day. It is this incredible fast growing universe of information that super computers are getting better and better at combining and creating structure, trails and landscapes in. And computers connect information in ways we didn’t even imagine possible, but ways we can still use and new trails of knowledge and understandings we can still explore, enjoy the benefits off, and wander around along. When super computers gets their hands on new knowledge and research-data they can see patterns and predict future scenarios and solutions that didn’t occur to us humans, simply because we haven’t got neither the time or the cognitive brain power to connect all the dots ( or bits) . Designers can now lean back and zip red vine instead of files, while watching new, stronger, and longer lasting designs and innovations created and 3D printed out all alone by these machines. Products and designs that are superior and created faster in all ways compared to what we humans can create. Not only can super computers do a lot of things we humans are far from, they also know more about each of us than even our closest friends. In tests the computers behind Facebook are actually better at predicting what you will do in a certain situation, what car you will buy, what you will vote and what spouse you will end up with than both you and your closest friends and family. The huge computers simply access big data and take a very close and statistic look at all it’s stored information about your behavioral patterns and flow, your relationships, likes and routines over the last 10+ years. It not only know what you like and when you smile, it also knows exactly how long you linger on certain posts, what you share, what you (try to) keep secret and what you avoid, and how those patterns change over time. With the speed of light it connects all these data, to learn more and more about you. Every second the computers learn more and gets a better understanding of what we react to, why and when. Selling this knowledge to other companies and organisations is just a small part of what this can be used for. Big data can be used for a lot of other things, things that are all new to us and where the future consequences can only be grasped by machines, not humans. It is a tip of balance awaited for many years, where machines can actually predict and steer better on the road ahead. An age where self-driving cars easily beat human drivers in performance and self-navigating apps and autopilots in many other areas will be better at tailoring a good and long life around each of us. A better life than we, in our doubts, lingering, drifting and emotional ups and downs, can create for ourselves. It is not likely that big data and computers will conquer reality and the planet from us, much more likely, that we will surrender control of the steering wheels, first of our cars and slowly more and more of our daily lives and routines, just because they are the most skilled at flying us, than we are them. “if you can’t beat them, join them” is an old human saying that are growing to make more and more digital sense as we equip ourselves with pacemakers, brain-implants, artificial limps and monitoring gadgets that keeps track on everything from our blood-pressure to sleep patterns to nutrition levels. All our individual digital gadgets and monitoring devices are constantly sending their stream of bits to the clouds, creating a live image of who we are and how well we are doing. Both physically, mentally, relationship-wise, economic and according to a lot of other parameters. Then the cloud image will get back to you through your smartphone or any other connected gadget you hold dear, to gently guide you ahead. Just like the GPS system in your car will pick the best road ahead, without too much traffic, the cloud and big data might, in the near future, be able to guide each and every one of us along digital trails and highways, without any of us knowing exactly where we are going. One question might be if we would really care? – Addicts of all kinds from drugs, to gambling and games gladly give up everything else for the next kick. And in the near future the big data driven systems monitoring us will get better and better at serving us individually emotional hormone kicks in just the preferred dose and time to keep us going, so it might be very hard not to just say what the hack, I’m in. Connecting data and getting a clear picture of our future, resources and options are mostly a technical challenge, but there is also a ethical challenge in it. Especially looking at how who controls these clouds and big data-streams and to what ends. Knowing about everything about everyone gives an extreme amount of power to who-ever can get into the driver-seat, especially when this knowledge can be distributed around the world and the data-streams and ever updated picture of what reality is, that each of us is looking on, on our screens, can also be manipulated to make us pick and continue along certain paths and avoid others. One of our challenges is that we humans are not really that sure of what it means to be human in the first place, what happens when we dream, what emotions really are, what life is all about when we think to much about it. The doubt, stories, the experiences, the theories, the adventures and the paths we are on has been part of what it mean to be human for a very, very long time. 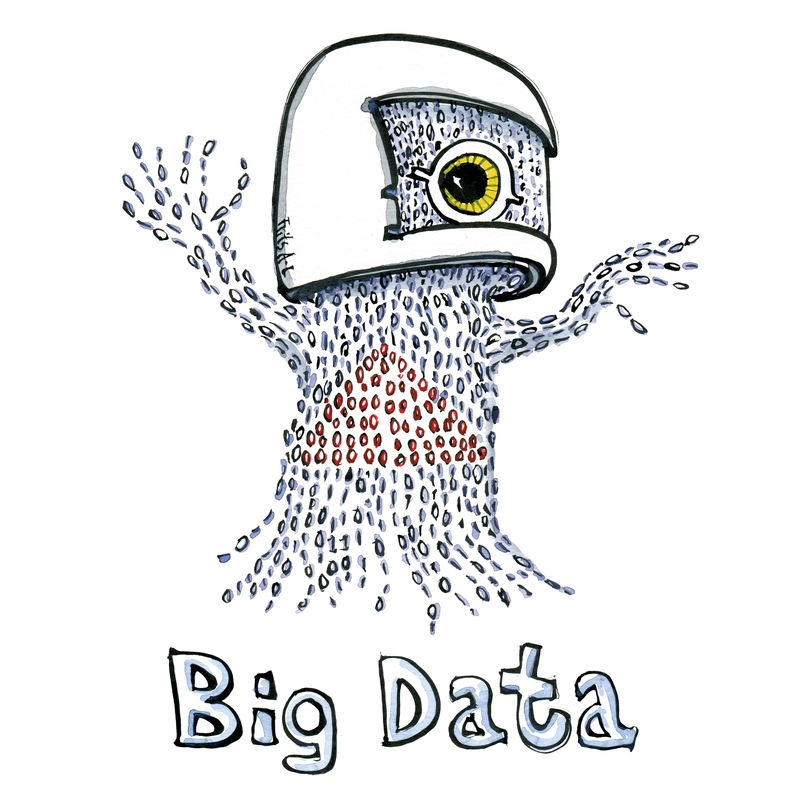 How big data might be about to change all this as a driver of global change is yet to be seen.